In the last month, third, fourth, and fifth graders worked on a cardboard engineering project. 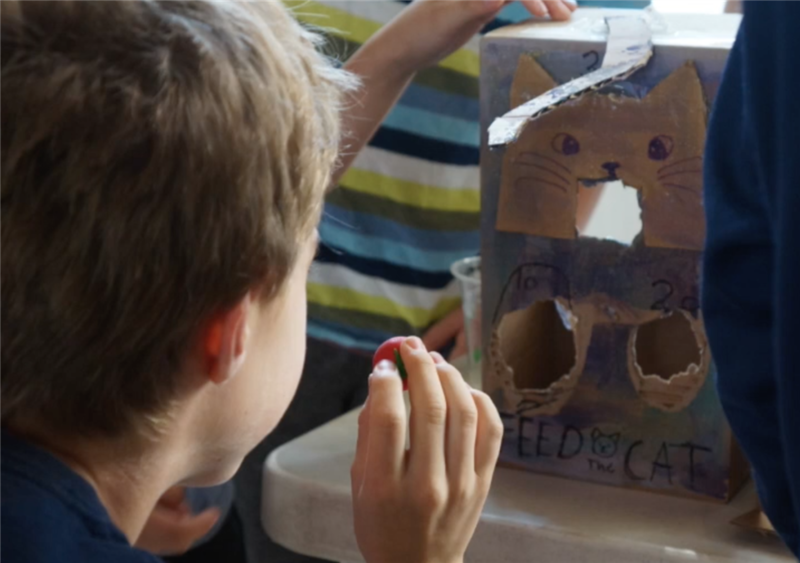 The challenge: To make carnival and arcade games starting with only a shoebox, tape, and recycled materials. The challenge culminated in a day of play, where classes were able to play each other’s games and reflect on each other’s work. Students worked in small groups and had three class periods to create a functional game, following the design process and engaging in creative problem-solving to bring their designs to life. The cardboard challenge helps students develop into 21st century learners who are resilient, resourceful critical thinkers. Learning to work collaboratively and persevere through obstacles helps them develop a growth mindset which can influence their outlook both in and out of STEAM. Each time students struggled to create a ramp that stood on its own, or brainstormed ways to create a lever for a pinball game, or tinkered with items to see what would make the best claw, they learned that they had the ability to complete seemingly unconquerable tasks. Enjoy a video of some of the fun!